"The Great Serpent Mound is a 1,348-foot (411 m)-long, three-foot-high prehistoric effigy mound on a plateau of the Serpent Mound crater along Ohio Brush Creek in Adams County, Ohio. Maintained within a park by the Ohio Historical Society, it has been designated a National Historic Landmark by the United States Department of Interior. 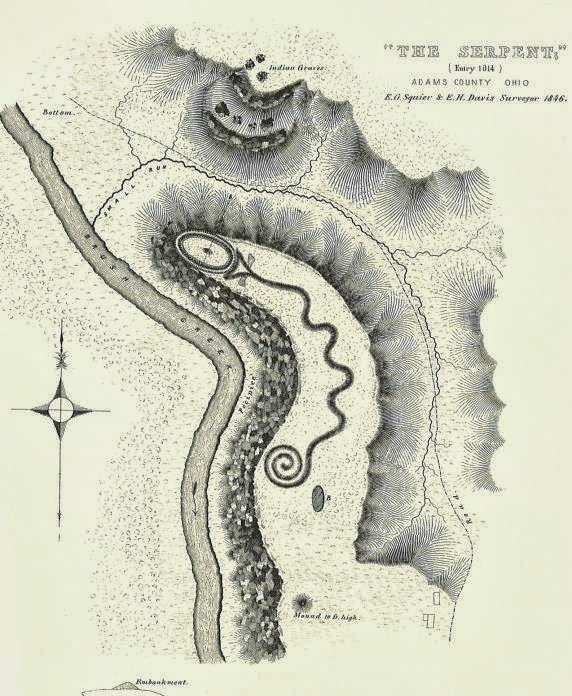 The Serpent Mound of Ohio was first reported from surveys by Ephraim Squire and Edwin Davis in their historic volume Ancient Monuments of the Mississippi Valley, published in 1848 by the newly founded Smithsonian Museum."